Have you ever had those days where just getting out of bed is too difficult? Where the thought of cleaning the bathroom, or running a load of laundry drains the last reserve of energy out of you? That’s where I’ve been since October. And let me tell you, it gets old – fast. The house didn’t get very clean, the meals were pathetic and coherent conversation was rare, but my OH was good about it. I spent more time in front of my computer and TV these past months than I normally ever would. Going out running errands with my mom would leave me completely exhausted with a migraine drilling a hole in my temples. Naps became a necessity. Sleep at night became fitful. Symptoms popped up that really worried me. Finally I made an appointment with my naturopath. We did a blood draw to run labs on my thyroid. Years ago, I had taken hormone replacement therapy and thyroid pills but they did nothing for my migraines so I was skeptical that anything would work. Two weeks in of taking them, I was certain I had been right. Nothing had really changed – other than my mood swings (which was so nice to have my calm personality back!!!) Finally I am seeing some results. Yes, I still need a ridiculous amount of sleep – Example: I get up to make my OH’s breakfast and go back to bed for a couple hours. Then need an hour or so nap three hours later. But most of the worrisome symptoms have disappeared. I’m so relieved. My migraines are easing off bit by bit – for now. It is nice to feel halfway normal again. So because of that, I have been able to mess around with the amounts for this ‘candy’. It is deeeelicouuuuus , but i am hoping to tweak it a bit more to get the consistency and flavor that i am really going for. Super simple. Quick. Delicious. Gluten, dairy and egg free. What more could you ask for? Cream the softened butter. Add rest of ingredients except the nuts. I like to chop my nut mix up a bit in the little blender before I add them in. Taste test mix. Feel free to make it a bit sweeter if you like! Add nuts. Scoop onto a plate or small dish and spread out. Put in freezer til firm. Cut into small squares and serve. ~Like I said, I am still experimenting with the amounts. I am also thinking of making it without the coffee next time (as we tend to eat it late at night and the caffeine isn’t sleep-friendly). Another switch I am thinking of is somehow adding in pomegranate. MMMM. Still pondering that addition though. Enjoy! And please let me know if you try it out! My next baking attempt will be rice pudding – since I made way too much rice the other night for dinner! 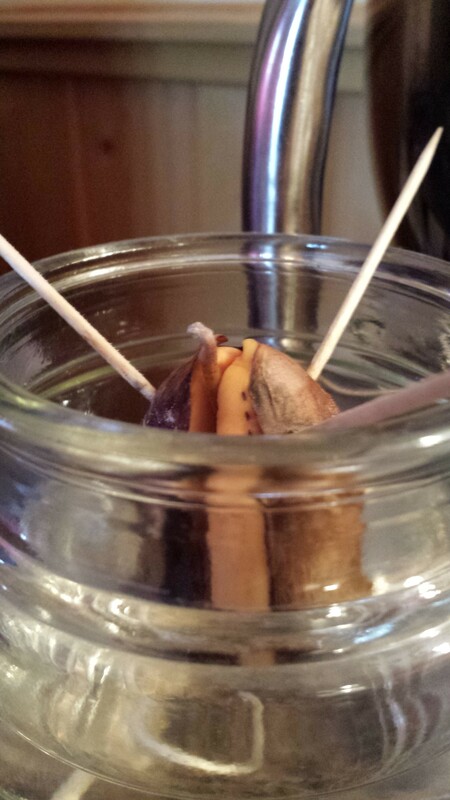 beginnings of the avocado plant!! !